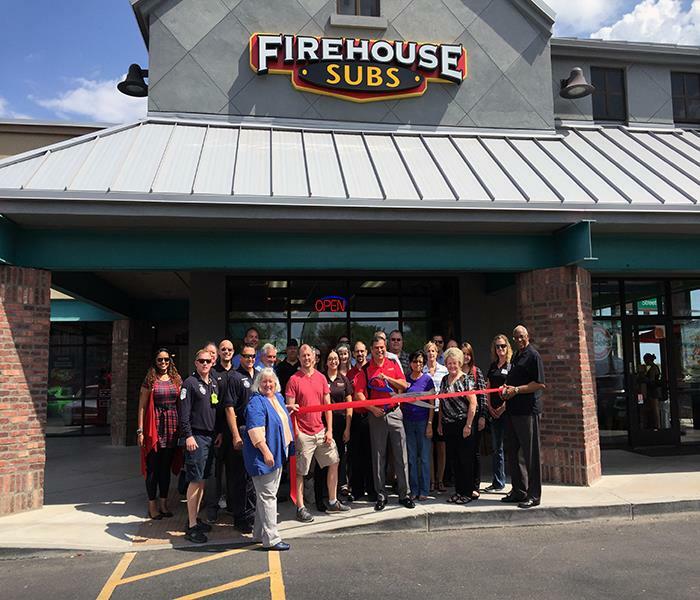 SERVPRO of Avondale / Goodyear / Southwest Phoenix attended the ribbon-cutting event at the new Firehouse Sub location in Goodyear. General Manager Daniel Liddle welcomed guests from the Southwest Valley Chamber of Commerce. Kristen Curry and Tony Brostrom of SERVPRO enjoyed the fabulous sandwiches and desserts. Chamber President John Safin welcomed all the local firefighters and guests of the Chamber who were on hand to celebrate. SERVPRO of Avondale / Goodyear / Southwest Phoenix is a locally owned and operated business ready to respond to your smoke or fire damage emergency. We are an active member of the Avondale business community and proud to do our part to make our local community the best it can be. SERVPRO of Scottsdale attended the ribbon cutting celebration at Experimac in Scottsdale with President/Owner Lynette Ray. Other members of The Scottsdale Chamber of Commerce and local dignitaries enjoyed the event including Suzanne Hayes, Senior Account Executive. Ton Brostrom, Business Development Representative of SERVPRO of Scottsdale enjoyed the fabulous lunch buffet from Capriotti’s Sandwich Shop. SERVPRO of Avondale/Goodyear/Southwest Phoenix is locally owned and operated. We are always happy to support local business initiatives. 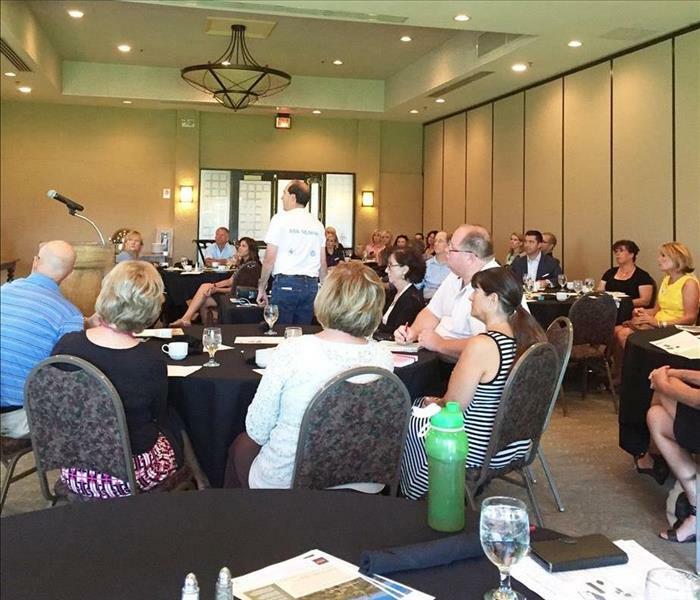 The Technology for REALTORS class was presented by Jeff "Mr. Tech" Raskin at the SAAR Heart of Scottsdale RMS breakfast at the Gainey Ranch Golf Club. Jeff was ready to answer all questions on how the Scottsdale Association of Area Realtors (witness the "ASK ME HOW") on the back of his shirt could improve their sales results by using technology. By using the reach of Social Media in conjunction with the tips previously provided by us to "increase curb appeal," we paved a road to success for our local Realtors. Our SERVPRO of Avondale / Goodyear/Southwest Phoenix support staff and technicians can help you make it happen by calling (623) 537-9999. We proudly assist our local businesses and residents in any way we can. 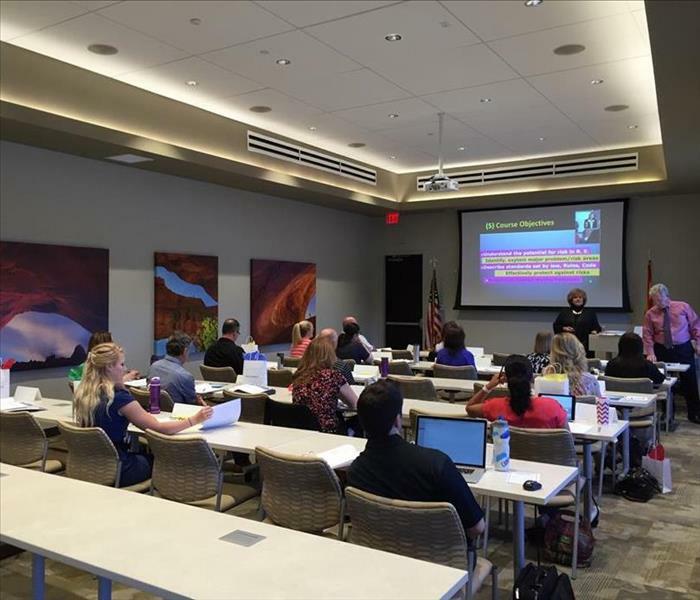 SAAR (Scottsdale Association of Area REALTORS) attended a Risk Management GRI class. Our SERVPRO of Avondale/Goodyear/Southwest/Phoenix sponsored a portion of this GRI-Graduate Realtor Institute presentation concerning the overall health and safety of the home. 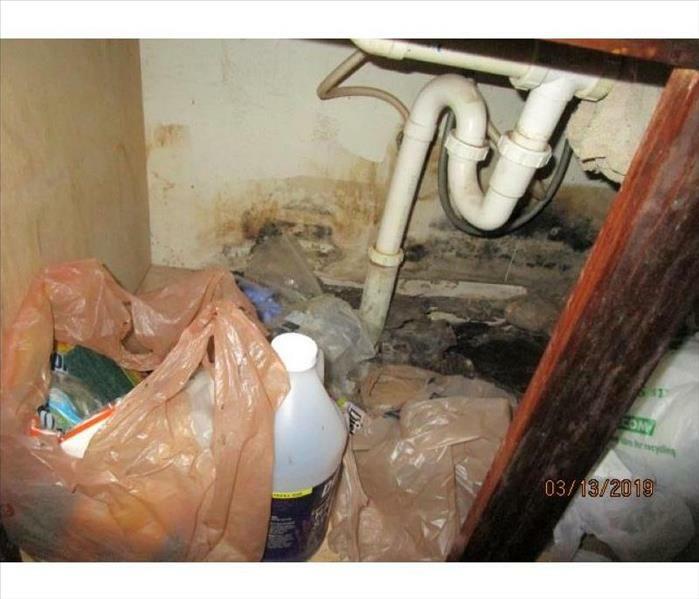 When smoke alarms are installed, moisture levels measured, plumbing inspected for leaks, and mold inspections performed, the brokerage office has performed its due diligence. Mitigating risk management begins with foresight. The SERVPRO instructors help educate the Realtors on identifying and eliminating any hotspots within a "Home For Sale." SERVPRO of Scottsdale sponsored the Risk Management GRI class for the SAAR. (Scottsdale Association of Area REALTORS) We recently sponsored a Risk Management Course Segment about cleaning a house to "increase the interior curb appeal." 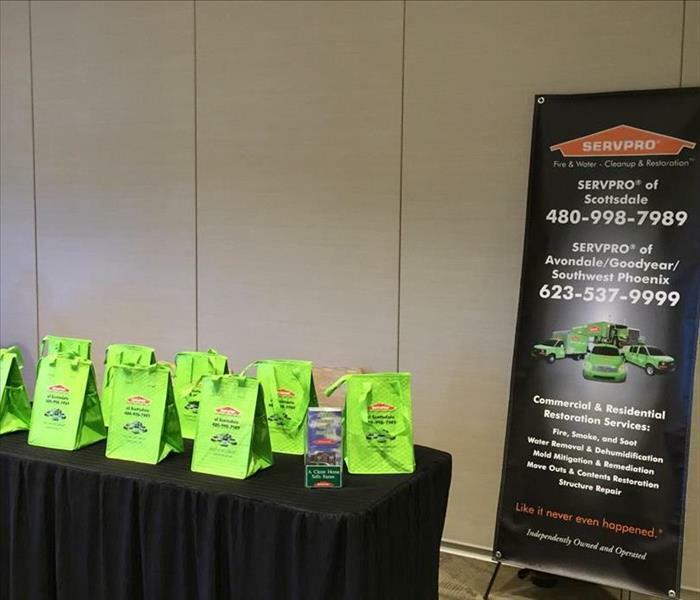 This photo depicts our table display of giveaway SERVPRO Green Bags and brochures entitled "A Clean Home Sells Faster." Realtors are aware that Air Ducts & HVAC cleaning, sanitizing, and deodorizing offer a beneficial addition to a potential buyer's perception of a well-maintained home. Our IICRC certified, skilled technicians from SERVPRO of Avondale/Goodyear/Southwest Phoenix can clean carpets and drapes with great results. We can help make a home "Sparkle." Representatives of SERVPRO of Avondale/Goodyear/Southwest Phoenix attended the one year anniversary of The Groves in Goodyear. The Groves, a Merrill Gardens Community, is close to golf, shopping and restaurants. The community features walking paths, landscaped grounds and a daily activities program. 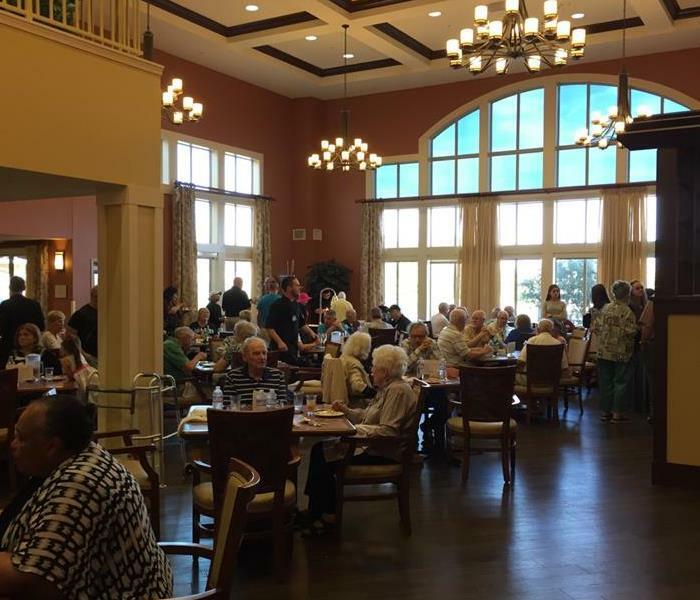 Residents enjoy retirement living through crafts, music, and other hobbies. Congratulations on your one year anniversary. The holidays are a very hectic time for many local families. Twinkling lights, flickering candles and fresh baked goods bring the holiday spirit into our homes. They can also be a recipe for fire and smoke damage in the Phoenix area; the number of electrical accidents and home fires increases during the holidays. 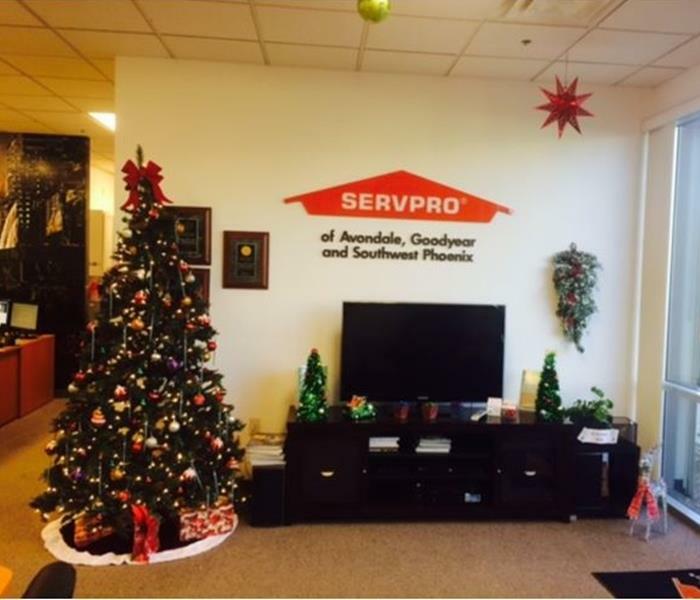 From SERVPRO of Avondale, Goodyear & SW Phoenix, please be careful and enjoy the holidays with your coworkers, friends and family. Our SERVPRO of Avondale, Goodyear & SW Phoenix Marketing Manager Lane recently attended the ribbon cutting at OCM Recycle West. Lane is pictured below with OCM Recycle West owner Patty Hannon. OCM Recycle was founded to provide a cost effective, environmentally responsible solution to the problem of ever increasing electronics in our landfills. 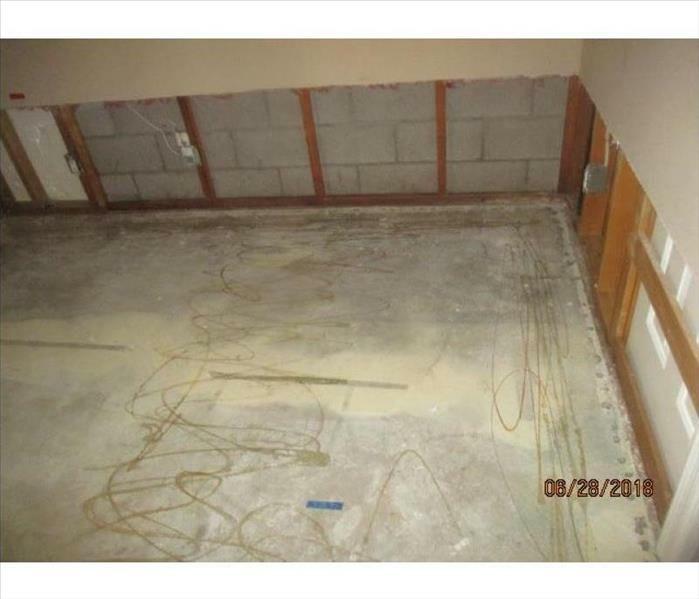 In the event of water or fire damage in the Phoenix area, SERVPRO helps our clients resolve Electronic Restoration challenges. SERVPRO Thanksgiving Turkey Drive for St. Mary's Food Bank. Loading turkeys in the SERVPRO Semi Truck for Thanksgiving Delivery!